Alessia Cara may be a Grammy winner, but that doesn't mean that she's used to what it feels like when her new music drops. The "Trust My Lonely" singer spoke with E! 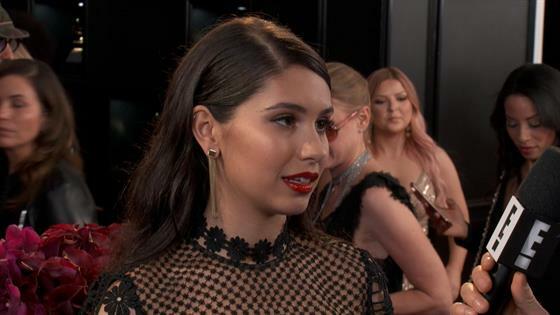 News' Ryan Seacrest on the red carpet at the 61st Grammy Awards, where she'll be presenting, and she opened up about what it's like when the music she's spent months working on in the studio goes public in the biggest way possible. "It's so strange. it's such a crazy thing," she said, talking about seeing the fan reaction to her sophomore album Growing Pains, released in late 2018. "It's like sending your kid to school for the first time or something on the bus or something like that. Even hearing them on the radio for the first time or hearing them on streaming apps or whatever, it sounds different almost. It's like, 'Why does it sound different here or on the radio?' Something about it changes." While Cara didn't earn any nominations at this year's ceremony, she took home the coveted Best New Artist trophy at last year's ceremony. And it was a culmination of years and years of practice in the shower, of all places. "That was what I would do in my shower," she admitted. "Just, 'I'd like to thank the Academy' with songs that didn't exist yet." To see Cara take the stage at the 2019 Grammys, be sure to tune in when music's biggest night kicks off at 8 p.m. ET/5 p.m. PT on CBS.